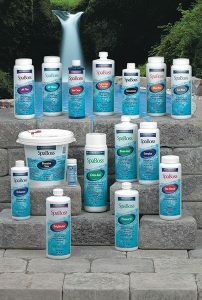 Pool chemicals are used to keep your pool water balanced and safe, while remaining gentle on your skin, eyes, and hair. Proper water balance will help protect your pool as well. Water with low PH, leads to corrosion of pool parts and damage to the pool surface. Swimming is uncomfortable, causing skin and eye irritation. A high PH reduces the chlorines sanitizing strength and invites algae and bacteria growth. Possible scale formation and cloudy water can exist. Chemical treatment involves proper water balance. No pools are exactly alike and neither is their water. Certain factors concerning the water need to be controlled before your disinfectant will work efficiently. These include: ph, total alkalinity, and calcium hardness. A chemical level charts if preferred. One of the most important things you’ll need to know is the amount of water in you pool. All chemicals are added to the pool with a ratio of chemicals to water. When using chemicals, read the labels carefully and follow directions precisely. Chemicals, when used correctly, protect you in the water but can be hazardous in concentrated forms. Do not add water to chemicals, add chemicals to water. 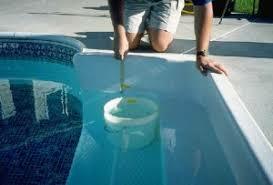 Use only clean, dry scoops to transfer the chemicals from the pail to the mixing container or the pool. Always keep chemical containers closed when not in use. When empty, do not reuse container. Handle all chemicals, liquid or dry, with care. Store in a cool, dry, well ventilated place. Store Muriatic Acid separately from your chlorine supply. A spillage of Muriatic Acid can be neutralized by Soda Ash (ph up) or Alka-Plus. Use only Stabilized Tablets in an automatic chlorinator. Do not use Calcium Hypochlorite Tablets. Keep a first-aid kit handy, but out of reach of children. 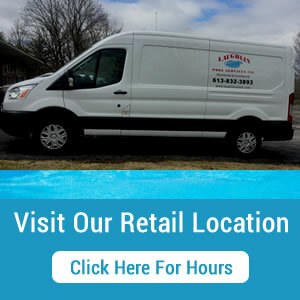 Your swimming pool will offer years of fun ,relaxation, and pleasure if you follow a few simple maintenance schedules. A sparkling clean pool is a joy to use and a healthy recreation outlet for the entire family. In addition to keeping your pool free of leaves and other foreign materials that can cloud the water, you must maintain proper chemical balance to destroy bacteria and prevent the growth of algae.